This topic provides an overview of how to configure player plugins. The Plugins option in the Players module can be used to add a player plugin, stylesheet or add a script to a Brightcove Player. The Plugins page will list all plugins that have been configured for the player. Brightcove provided plugins will not be displayed (i.e. Social, Audience, etc.). Note: Plugin functionality is available for Video Cloud Pro and Enterprise customers. If you are interested in upgrading your Video Cloud account, please contact Brightcove for more information. For information on creating your own custom plugins, see Quick Start: Plugin Development. 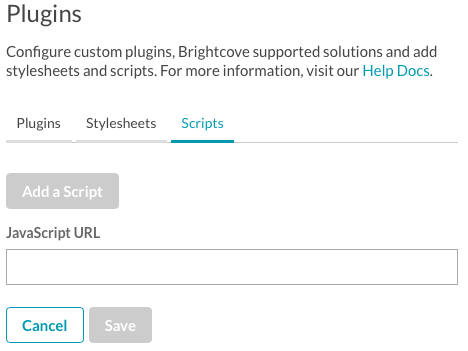 For Brightcove Plugins, select a Brightcove Plugin from the list. 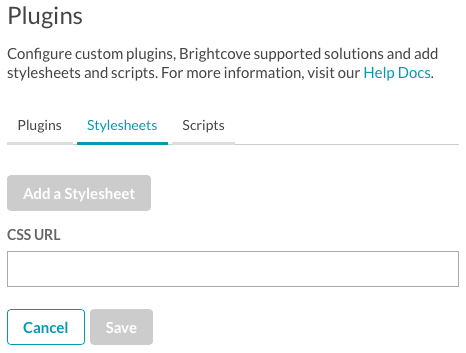 Note that all available Brightcove plugins are not available in the list. For a list of all Brightcove provided plugins, see the Brightcove Player Plugins topic. CSS URL - Provide a URL to the file(s) that contain(s) the CSS code used by the plugin. Be sure you supply valid CSS. If you supply non-valid CSS, you will see an error in the preview window. To edit any of the plugin properties, click on the plugin name. To delete the plugin, click the delete icon ( ). A CSS file can be uploaded to customize the player appearance. Provide a URL to the CSS file. To edit the file path, click on the file name. To delete the file, click the delete icon ( ). A script file can be uploaded to customize the player appearance. This is the code that defines your Brightcove Player. This file includes code for any of the plugins you have added to the player. The plugin code is also included in the Standard (iframe) player implementation. For information on creating plugins, see the Quick Start: Plugin Development developer document.